Organic Design, say good-bye to sharp edges, we saw a lot of bath products that had sensuous and more organic shapes. Everything from tubs to lighting seemed to be curvaceous. Softer finishes -- last season, polished copper made a bit of a comeback, but this season, soft is in -- as you can see with a lot of brushed gold and in Kohler's case, French Gold. Lovely! Thin remains 'in'. Gone are the days of thick ceramic pieces in the bath. Manufacturing techniques have improved and it's now possible for brands to create wafer-thin vessel sinks and even the pedestal sinks don't look as clunky. And fear not -- the ceramic themselves are very durable. We love this for bathrooms that are somewhat smaller -- any time you can cut down on the profile of the products in the room without sacrificing the beauty or details, that's a win-win! So here are our picks for product styles we saw in New York City. Of course in May, we'll be headed to the International Contemporary Furniture Fair (ICFF) where we will see really far-out contemporary products -- we can't wait! 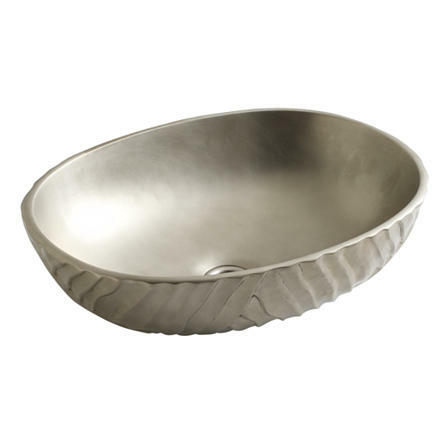 This vessel sink from Kohler actually hits upon TWO of the trends: it's both organic in shape and thin! With its gently curved, organic shape, the Iron Plains sink combines distinctive style with the extreme durability, strength, and vintage soul of KOHLER enameled cast iron. This above-counter sink features a dual-color design that lets you choose your own combination of top enamel color and underside paint color for the perfect look. Here is Kohler's French Gold finish on a faucet. You can see how much 'softer' this finish is than polished gold. In the meantime, here in Boston -- this is the beginning of Design Week. If you are interested in design (which we assume you are if you are reading our blog), you have a host of excellent things to do over the next week. http://www.bostondesignweek.com/#!april-7/ck4f Go and look -- educate yourselves on all things design! Then report back to us about what you saw and loved (and even what you saw and hated!) #BostonDesignWeek"